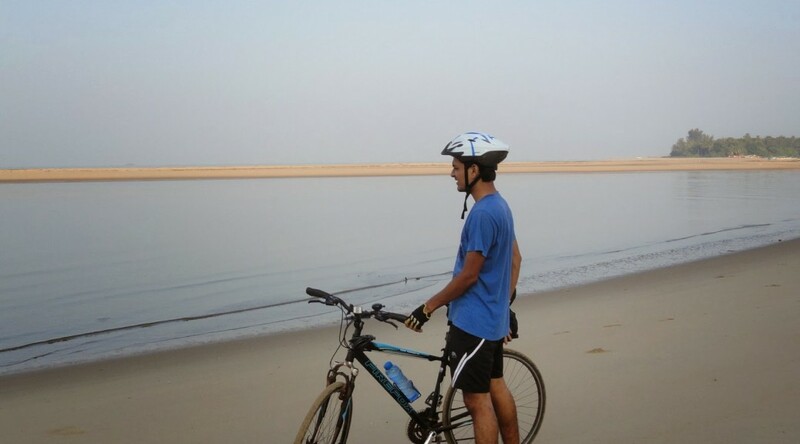 16 Feb, Kumta – Marvanthe Beach, Padukone (96km) – 8hrs+ – Ghats till Bhatkal (~56km)! At times riding through rough terrains, bad roads and steep ghats, you’ll always want that the journey should be over. But when we reached Tiracol, Goa it seemed like – What !? Already there ? It meant that we had no more travelling to do on our cycles enjoying those jokes with Surya, Puru, the good downhill slopes through dense trees, the slow climbs overlooking huge beautiful beaches.. All was over. When I finally locked my cycle in my building, Even though I had some ruptured skin down my bum, I felt I wanted more.. What would now remain of this whole journey (probably once in a lifetime) was fond memories, discussing events in the office with friends..
We left early for Devbaug. At the beach the guy charged us ₹300 for a minute’s ride opposite Devbaug to Bhogave beach. From there on we trotted on foot to reach a road leading to सागरी महामार्ग (Coastal Highway). There on the roads were always up, down, winding, scenic till we reached a ghat prior to Vengurla. Where the road climbed, not just it but it worsened just stones stuck in tar, the upper layer of tar had weathered away. Our cycles too took the brunt of the bad roads. When we reached down Vengurla almost as soon as the ghat ended, our wrists were aching. We had some heavy breakfast of ‘misal pav’ and carried towards Goa. On our way just prior to Arawali, an uncle waved Surya asking him to stop. He asked about our trip and said that it was his dream in his youth to do the same, he then invited us to eat ‘unforgettable groundnut ladoos’ (similar to groundnut chikki). Had tea in the shack selling those as well, all on the house. We thanked the uncle and carried towards Redi and then Terekhol (Tiracol). The ferry just evaded us but it came back soon. The ride to Goa crossing the state border was free !! And there we were having crossed 4 district boundaries and 1 state border in Goa. Tiracol to Aarambol wasn’t far away another 20mins and we rented out a sea-side room for the night. In the evening we went to the Sweet Lake and had a good swim. I planned the next day I’ll have a visit to my sister’s place in Succorro. So we left around 10.30 having breakfast, tea, icecream and lunch. It seemed as we ate more than we rode. 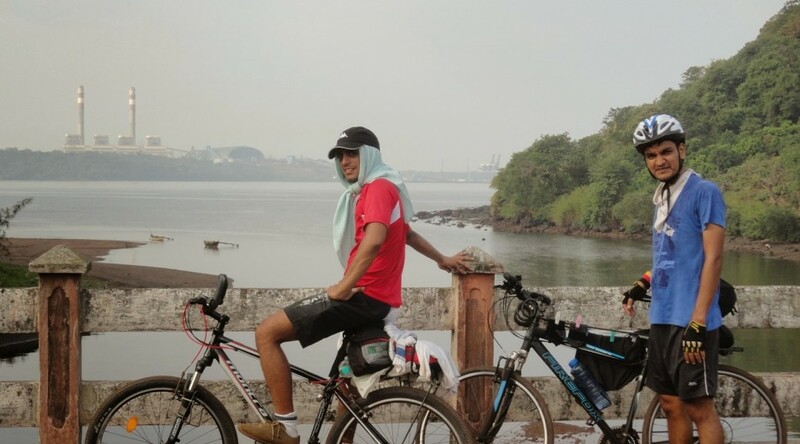 We had confirmed a bus back to Goa which would ensure our cycles too got a ride back which departed from Mapuca. So after an enjoyable time with my sister and her family we headed back to Mapuca for our journey back to M U M B A I.
ST Bus was scheduled at 8.00am, we already at the ST depot by 7am, ensuring our cycles were ready (handles turned, etc) for the bus ride. The bus took off and reached NH 17 via Hathkhamba. It took the bus around 6 hrs to reach Malvan bus depot. When we assessed our state of the cycles. Puru’s rear rim’s spoke were broken. Rest of the cycles seemed OK.
We took a lunch near the ST depot and headed towards Tarkarli which was about 7km from Malvan. The road was smooth tar one spinning through lovely canopy. We fixed a hotel room and went for a evening stroll on the beach which was just opposite to our room. Me and Surya were so excited with the long beach that we went for a jog for about 4km or so. The ended relaxing, watching TV, enjoying sea sounds. 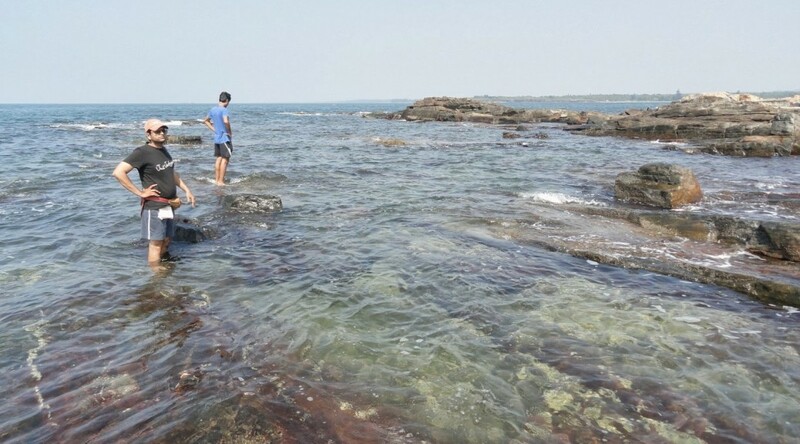 Malvan’s waters are clear and pristine with a lot of wildlife. We even found a black sea urchin in the rocks of the water. On our way back, we visited the Laxmi Cashew Factory, Surya trying his hand at breaking the Cashew shells. The evening had a little more cycling in store, a Devbaug visit to check with the locals about a ferry / boat ride down south side of the devbaug backwaters. On our return, we took the ‘National Highway 17’, as put by the fisherman for the beach ride back to Tarkarli in the low tide. The sight of Jaigad from Velneshwar makes you impatient, makes u do the distance…Jaigad was on the otherside of creek. Our first stop was atop hills and back down to the sea level – Tavsal jetty. The road wasn’t good, and we nearing Tavsal gave us more beautiful scenery that awaited us further in our journey, the water now starting to turn bluer than the initial murky color that it had, the vegetation deeper and dense. We had a nice stop at Tavsal, savouring sweet tangy taste of Kokam sarbat. The ferry took us to Jaigad, where we had to climb a hill again and down to Ganpatipule. We reached Ganpatipule around noon and decided to have lunch. The last day at Velneshwar we had come to a reassessment of our itinerary, we decided we’ll take a bus to Malvan, save 2 days which we could use to rest and enjoy at Malvan and Aarambol, Goa. A quick lunch and another big climb of Ganpatipule to Ratnagiri (sea-side route). Puru soon found out his rear tyre was punctured. I and Surya were waiting for Puru when we saw him walking pulling his cycle. A scene we had got accustomed with during steep climbs. We refreshed ourselves in a deserted shack’s cool shadow. We climbed back again, the nightmare of any cycle tour awaited. Puru’s rear tire was flat. We managed to get Puru in a tuktuk with cycle in rear and me and Surya went on the lovely roads overlooking the beautiful beaches south of Ganpatipule. It was one of our most lovely routes. Ratangiri was closer than we thought, around 4pm we were there. Puru waiting for us after getting his tire fixed. At the ST stand we found the Malvan bus at 4 had already left and another one for Sawantwadi at 6pm would drop us to Kasal. Deciding against the night travel we found a hotel to stay and headed towards Mandvi beach/jetty. Not a great one, but we relaxed along a beach side shack sipping tea and strange oval cut कांदा भजी. We had a big ghat to cross just ahead of Anjarle, but again local fishermen advised us an alternative route for Harnai, via the fishing village. Again a boat ride took us through Anjarle’s creek. In the haste of the yes/no to reach we took a wrong turn (well a right one for cars, bikes) towards Dapoli for which we had to climb a huge ghat, a good road SH 4 though, but thats not what we had planned, we wanted to go coastal through Murud (Ratnagiri), Ladghar beach, etc.. However this long ghat took us through to Dapoli town. Further from Dapoli we climbed yet again, we were still climbing, never had come down the elevation we had gained for Dapoli. The destination now was Dabhol jetty. This would take us down south into the heart of Ratnagiri’s infamous Power project, Enron. Now christened as Ratnagiri Gas and Power Private Ltd. The last 10km to Dabhol were downhill, entirely. We wondered if we had to climb it, it would’ve taken our heart out! Dhopave jetty, south of the creek and we had to climb again rising into Enron. However the roads were good and the down hill was long and easy which helped us cover more distance. Coming down overlooking Guhagar was a delight. … we didn’t care where we sat and ate..
Another few kms and I was famished ! I had a very short and quick lunch at Dabhol jetty, since we had a quick ferry to catch in 40mins around 1.30pm. Now with all the ghats that we had climbed, the battery entirely drained out. I found myself dizzy, empty stomach. We stopped by road, and ate Parle’s 20-20 biscuits and Glucon-D. With a more than a partial charge, we were ready and headed into the lovely Velneshwar beach. A small village, Velneshwar has the entirety of the beach’s length as its boundaries. From the beach’s north end one can see Jaigad’s JSW plant and Jaigad light house. We stayed at a beach side room, clean even with a TV set. It was my first time that consecutively I was gonna do another 60km+ stretch on cycle. Bum a little sore, but doable.. 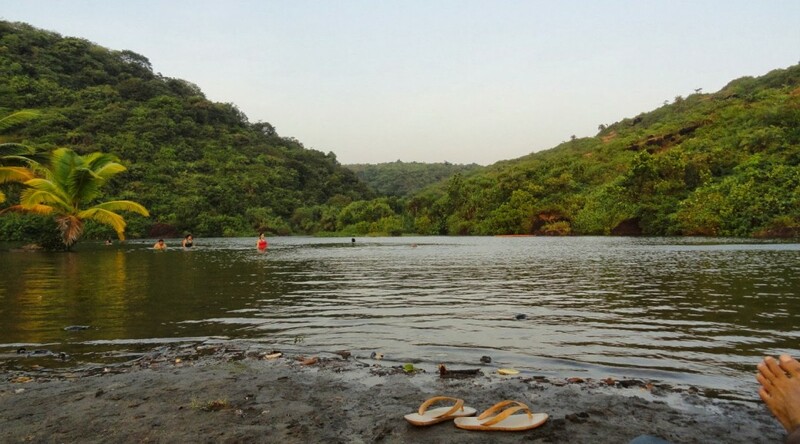 The lovely small ghats enroute to Shrivardhan via Aaravi was morning bliss. Surya getting some Salman Khan styled photos (also read as without T-shirt). We halted at Shrivardhan for ATM, coconut water etc and headed towards Harihareshwar, just as long the name is.. so seemed the distance. The ghat to Harihareshwar was never ending, the worst part – heat! Konkan doesn’t honour Dec. 1. Heat stays and so does the humidity. Puru’s cycle and its bag weight too show what is extra / unneeded at such a trip. We had to stop on the ghat under a tree where we felt we couldn’t move ahead without some Glucon-D. The ghat had started post a dry barren flat road which had the sun drain us out. We reached fairly early at Harihareshwar, 11.15am. But we felt we had travelled 100km+ thanks to the Konkan terrain and the sun. Post food we moved towards Bagmandla jetty, where the govt. ferry service would’ve made us wait for more than an hour, the private one was earlier. Opting for it, we waited for it under a banyan tree, a typical tree with a peripheral wall around it so that travellers like us could rest. It was there where we found our ‘guide’ or rather a misguide. He said that we could go to Kelshi (our scheduled day-2 destination) via a shortcut, then Ganpatipule was just 40km ahead of it !!! Yes you guys read it right he said Ganpatipule. When that Ganpatipule distance came out his mouth, I knew he wasn’t to be believed. He kept talking, friends, bullet riders, etc. Of all the crap that he gave us, two things were right – Bagmandla to Bankot, You change districts, Raigad to Ratnagiri and there was a ferry (boat) ride at Kelshi and a huge huge shortcut! Bankot, Ratnagiri. We had crossed into the famous Alphonso mango district. Guys on the ferry had warned us that ferry at Kelshi was not to be relied on. They said luck could help us get through. We still believed and kept asking the local fishermen about it, they were happy enough to send us that route, बोटी मिळतील, We would get boat rides.. Bankot to Velas we had to walk, climb on footsteps through a sea side terrain of rocks, sand, beach and get on to the road which connected Velas. Ahead of Velas was another ghat, rocky, full of red stones, red sand and bad roads. The decent was a full speed one, our suspensions just mildly protecting our frames and our shoulders, but Surya’s thirst for a down-hill full speed decent knew no boundaries, bad roads, steep slopes, incoming traffic, nothing stopped him. Down the hill, we were straight at a creek. We couldn’t see any jetty! all we saw was some fisherwomen getting off the trucks, tempos, tuktuks and walking straight into the ferry. We asked one for Kelshi, she pointed us straight towards a small village across the creek. The sand/soil was too wet to walk with shoes, we tied them on our cycle frames and walked into the creek. It was lovely! 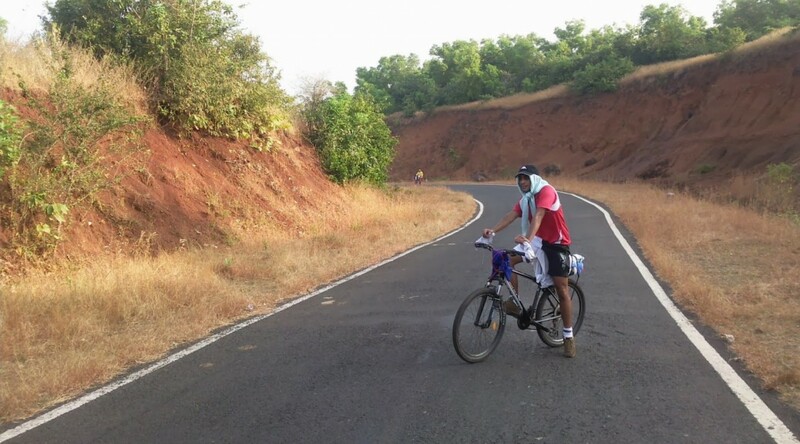 Our cycles, us and a huge tropical Konkan scenery. We were thrilled to get to this end and already said that this crossing was ‘पैसा वसूल’ part. A boatman just had taken a woman on the otherside and while rowing, he shouted that he’ll be back, just wait. When back, what we saw was not really possible. In his small boat, we had to cram 3 cycles and 4 people. The boat all by itself was something of a canoe and just as much of imbalance with such a payload.But Mr. Abbas, was confident and led us through and even posed for our cameras while we toiled to keep the boat aflot.